A little while back I had blogged about making zippered pouches/drawstring pouches to help Danny and her cause, well since she got such an awesome response she decided to try for found two. They received an awesome donation from a blogging friend to buy each of the 40 girls their own pillow! So now, Danny needs your help with PILLOWS! 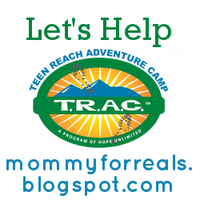 To refresh your memory, the organization is..
"Teen Reach Adventure Camp which is a three day single gender camp for kids ages 12-15 providing a fun-filled, outdoors experience with safe loving adults to help provide an experience that brings hope and encouragement to these hurting teens. For more information on this camp, you can either visit their website here or visit Danny's original blog post here. They have something extra special planned for the girls this year. They will be hosting a pajama party for them the first night of camp. When the young ladies arrive to their rooms, they will find some up-cycled scrub-bottoms-turned-bedazzled-and-pretty PJs, a handmade zippy pouch filled with make-up and toiletries and now, thanks to a very generous gift from one of my bloggy friends, a fun pillow! Pillows are very important tools. They are snuggly when we're cold, naturally, but they are also our shield when we are uncomfortable; our comfort when we really need to hug; our weapon when we lay down our defense to play with our friends. They collect our tears when we are sad and our screams when we are so excited we just can't hold them in. They are more than just decoration and this is why we are ELATED to have been blessed with such a wonderful gift for our young girls. The pillows are 20" x 20" and we would like envelope cases for them (meaning no zippers). Unlike the pouches, we have decided each case should be unique, so feel free to use more than one fabric. Use an old quilt block you have been holding on to without any real plans to use. Try a new technique you've been hesitant to try out. Use a solid and draw on it with a bleach pen! Embroider! Piece! Applique! Whatever you like!" -Fabrics should be age appropriate. Remember, these are for teenagers. Dancing teddy bears holding bottles and sucking on pacifiers might be cute for your 2 year old niece, but not for our young women campers. Think bright colors. Think modern. Camp fabrics are acceptable as long as they flow with the teenage vibe! -We are only making pillowcases for the girls, so please no boy-ish fabrics. Remember, the pillows are 20" x 20"! Echinops and Aster PDF and the right size! The tutorials are NOT for 20" x 20" pillows. Please adapt accordingly. Danny needs 40 pillowcases and needs them in her hands no later than Friday, July 6th. She will be making any pillowcases that don't get claimed (i'm hoping we can get them all claimed for her!! ), giving her a week to get them made, packed up and sent off to camp. Please keep in mind shipping times when deciding to make these. They are super easy; only take 10 minutes to make the basic shape. Now, if you feel this is something you can do, comment on Danny's blog post and let her know, she'll add you to the list. 10 minutes, easy peasy - I hope you'll consider signing up!